Fish Oil (an omega-3 oil) is an extract from the tissues of oily fish. Fish Oils composed of omega-3 fatty acids known as EPA (eicosapentaenoic acid) and DHA (docosahexaenoic acid). These compounds were found to reduce inflammation and provide other health benefits. The accumulation of omega-3 fatty acids in the tissues of fish is attributed to consumption of either microalgae or prey fish by oily fish. The dietary source of fish oil is cold water oily fish, which includes sardines, mackerel, herring, salmon and anchovies. The highest concentration of omega-3 fatty acids is in sardines herring, salmon, Spanish, Atlantic and Pacific mackerel and swordfish. Before consumption of the supplements containing omega-3 fats, consult your doctor as it may negatively impact your health if you take any medications that thin your blood. 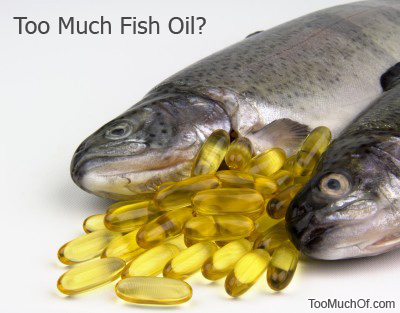 With daily consumption of the supplements, fish oil toxins may accumulate to dangerous levels and eventually cause an array of systemic illnesses that would be very difficult to diagnose and treat. Although omega-3 supplementation may seem like a logical choice for health benefits, too much of anything or even a modest consumption of fish oils may produce different effects on a human body. While the studies have connected the omega-3 fatty acids to improvement in certain conditions, most numbers represent a statistical calculation that does not always represent an accurate picture of the nutritional and physiological states of the studies’ participants. Despite the numerous studies that have been praising the fish oil benefits, an extremely profitable 1.1 billion industry, the latest studies have been providing a different view on the omega-3 hype. It is strongly recommended that fish oil supplements are takes only on a short term basis and under supervision of a doctor. The best long term benefits of consuming Omega-3 fats can be obtain via consuming a wild caught fish such as cod, salmon, tilapia and mahi. The farm raised fish should be avoided as its mostly raised with soy and corn.